With that price volatility, comes the emotional roller coaster that accompanies any financial market. There’s no getting away from the emotional ties that come with grain marketing. We have to recognize the predicting the future is impossible and you simply have to make the best decision for your operation given the variables in front of you today. See below for an excellent representation showing how humans typically respond to financial market volatility. There is one key difference between the image above and the real-world grain marketing roller coaster….. There are often just as many producers who are angry at the “top” vs. those that are euphoric. Selling into rallies becomes frustrating for many producers as their early, pro-active sales become “too cheap” with the benefit of hindsight. We all need to realize that in 99.99% of instances, a grain marketing sale/hedge can always be judged in one of the two following ways. No sale/hedge is perfect. In an ideal world we’d wait for the top and sell it all. Well, we don’t live in an ideal world! Even the most structured grain marketing plan can be hard to implement in real time. 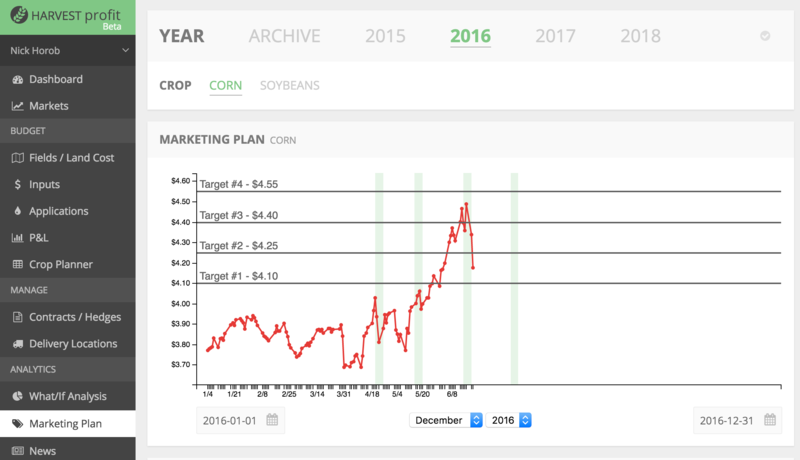 See below for an example marketing plan that inlcudes profit-based price targets and decision dates targeting the seasonally strong times of the marketing year. Note: All price targets of this hypothetical plan have been hit. We’re converting to an OHLC-type chart to better display intraday price moves. In many cases, a producer with the above plan in place would fail to pull the trigger when the 3rd and or 4th targets are hit. The producer will be frustrated with the 1st and 2nd sale and will transition from “marketing plan” mode to “hit the high” mode. We need to try our best to fight that mindset. We need to focus on making decisions that make financial sense for our farm. Easier said than done, I know. Here’s a simple framework for how I like to approach farm risk management. Use the seasonal tendencies to your advantage. Premium prices tend to occur during periods of where the crop can put in peril. This most often occurs from April-July. Making panic sales below your cost of production during the winter is rarely the right thing to do. Put your self in a position where you don’t need to make sizable marketing moves during these seasonally weak times of the year. Know your numbers. The market doesn’t care about your specific cost of production, obviously! But knowing your numbers will allow you to make confident risk management decisions in the face of always-changing commodity prices. Make a decision and don’t look back. Don’t let past decisions handcuff you from taking advantage of profitable marketing opportunities. What’s done is done! All of this is easier said than done. Find a system that works for you and work hard to maintain discipline. Farming is a business and a big business for most of you. Treat it like a business not a speculative, volatile hedge fund. If you’d like to learn more about our software as well as receive educational articles, sign up for our newsletter below.